Meal replacement shakes are the food of the future. They’re convenient, quick, and easy. They pack a meal’s worth of nutrition into one beverage, helping you stay healthy, lose weight, and save both money and time. Part 1 ranks this year’s 13 best meal replacement shakes in order, and part 2 will go over how they work and answer some FAQs. 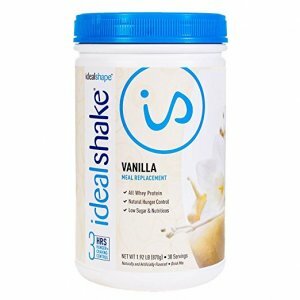 IdealShape markets their IdealShakes as “the ultimate meal replacement shake for weight loss,” and they’re not wrong. Between their highly effective weight loss plan, their appetite suppressing protein blend, and fat-burning nutrients, IdealShake is a great product for anyone looking to lose a few pounds. First of all, they incorporate slendesta, a potato protein extract that’s demonstrated some powerful hunger blocking abilities. No wonder potatoes are so filling. Paired with their blend of all-whey protein and fiber, these shakes keep you full for a good while. They also only have 1-2 grams of sugar in each serving, which is one of the lowest sugar counts on the market. Oh, and, they actually taste good. Cost-wise, they come out to about $1.67 or less per shake, which also makes them one of the most affordable options. Herbalife has built a global empire around their nutrition products with their meal replacement shakes at the helm. While they’ve got some flack for incorporating some processed ingredients and preservatives, including hydrogenated oils, they’ve since updated their formula to include more healthy, natural ingredients. Either way, it’s still far better than consuming a fast food meal when you’re on the go. Herbalife shakes contain 21 vitamins and minerals, 9 grams of protein, and 3 grams of fiber. The protein comes from soy isolate and casein. The casein protein helps you feel full for a good while, even though the shakes only come in at around 170 calories. The shakes also include biotin, which is a b-vitamin that promotes clearer skin and healthier hair. Herbalife Formula 1 is touted as one of the tastier meal replacement shakes and comes in flavors like banana caramel, dulce de leche, mint chocolate, piña colada, and cookies ‘n cream. 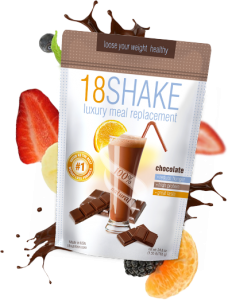 Branded as a “luxury meal replacement,” 18 Shake is made from all natural ingredients. It contains no gluten, no soy, and no artificial sweeteners. This shake has been one of the most talked about in the meal replacement market for a minute now. Part of the reason is their top quality “dual-protein formula” that uses both whey protein concentrate and whey protein isolate to offer a protein blend that packs extreme weight loss and muscle building power. With the addition of fibersol-2 and 24 vitamins and minerals, it’s packed with nutrition and will keep you feeling full for a while. At the same time, each shake has only 90 calories, making it one of the most low-calorie shakes on the market. Replacing one meal a day with 18 Shake would likely decrease your calorie intake by 500 calories or more, so it’s no surprise that a lot of people lose weight with 18 Shake. While 90 calories wouldn’t usually be enough to keep anyone full for long, the 18 Shakes incorporate fibersol-2 as an appetite suppressant. 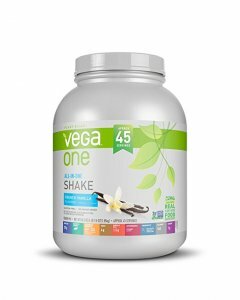 The Vega One shakes are organic, all-in-one, plant-based meal replacement shakes that avoids dairy proteins while offering high amounts of amino acids. It’s great for both weight loss and building muscle mass. You can mix their protein powders with water and ice, but they also offer easy recipes for all kinds of add-ons and mix-ins such as almond milk, greens, and seeds that turn your protein shake into a fully balanced meal. This is one of the few USDA certified organic meal replacement shakes on the market. It’s also gluten-free, and non-GMO verified. The vitamins and minerals in Vega One shakes provide a whopping 50% of your daily value, and the shakes also contain healthy helpings of probiotics, antioxidants, and Omega-3 ALA (found in plants). It comes in chocolate, vanilla, plain unsweetened, coconut almond, mocha, and berry. 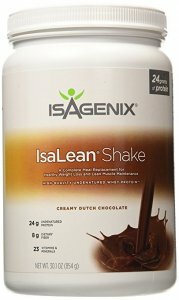 The IsaLean Shake by Isagenix is a meal replacement shake that’s offered as part of Isagenix’s 30-day diet. The shake’s formula is specifically designed to promote weight loss and lean muscle mass. The diet program is similar to the SlimFast diet. You replace two meals with two shakes, have two 100-150 calorie snacks (which can include their snack bars), and one 400-600 calorie meal. This adds up to 1,200-1,500 calories per day, which will put anyone at a calorie deficit large enough to lose a few pounds. Shakes also include 8 grams of fiber and branched-chain amino acids, which are great for promoting muscle growth. Ingredients are natural and contain no artificial flavors, colors, or sweeteners. The shake is offered in a variety of vanilla, chocolate, and strawberry flavors, and they even offer kosher shakes. They’ve actually done clinical trials that have shown the IsaLean shakes do facilitate weight loss, so that’s a plus. Shakeology took over faster than almost any shake on this list, and it’s no surprise — this shake comes from Beachbody, one of the hottest fitness MLMs in the world. Also not surprisingly, Beachbody refuses to let their Shakeology shakes be classified. Is it a meal replacement shake? A weight loss supplement? A protein shake? According to their website, both all and none of the above. It’s an “ultra premium superfood shake” that’s meant to be a 130-170 calorie snack. While you can add a few ingredients to up the calorie count and make it into a meal replacement shake, it’s also recommended as a “pre-loading” shake. Pre-loading is basically just bodybuilder talk for filling up on a nutritious shake right before a meal so that you eat less. 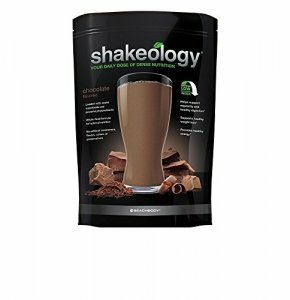 Shakeology doesn’t want to be associated with low-quality meal replacement shakes that sacrifice nutrition for weight loss. They’re big on addressing nutritional gaps by incorporating lots of vitamins and minerals, as well as enzymes, prebiotics, probiotics, and antioxidants so that you’re improving your health in a more holistic sense. Of course, many people use Shakeology shakes for weight loss. It’s packed with 17 grams of protein from their proprietary protein blend, which includes whey, pea, chia, flax, and quinoa protein. It’s a solid blend that’ll do wonders for suppressing your appetite. The shakes themselves are pretty tasty, and they come in cafe latte, chocolate, vanilla, strawberry, greenberry, and tropical strawberry, as well as several vegan options. 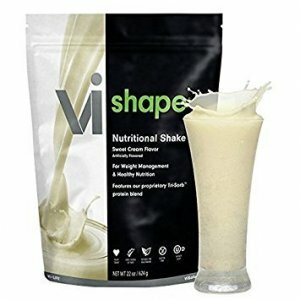 The Vi-Shape shake mix by Visalus is part of the ViSalus Body by Vi Challenge kit. It features their proprietary Tri-Sorb protein blend, which contains both soy protein and whey protein. Other benefits of the Vi-Shape shake are that it’s low in fat, sodium, sugar, and gluten-free. It’s also got 26 different vitamins and minerals, and it’s a good source of calcium and fiber. Overall, if you don’t buy into the bad news about soy protein, this is a solid meal replacement product. And apparently, it tastes like cake batter. 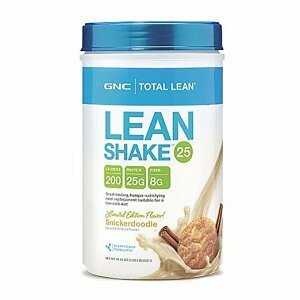 GNC’s Total Lean shakes are formulated with an oat base, so they’re very rich in fiber and antioxidants, which is an area where some meal replacement shakes are lacking. The aim of GNC Total Lean is to support the growth of lean muscle mass by providing high-fiber meal replacement shakes as well as an exercise program that targets toning lean muscles. 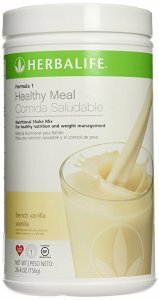 High fiber and vitamin counts in this meal replacement shake leave you feeling full off only 180 calories per serving and also provide a more balanced diet. At $39.99, it’s also relatively affordable, although one package only comes with 16 servings rather than a month’s worth. GNC also offers a money back guarantee, so there’s not much to lose. Soylent is a food beverage that was released by a crowd-funded Silicon Valley start-up just a few years ago. Thanks to some excellent branding and support from bloggers and influencers, they’ve made a name for themselves. These shakes really started gaining momentum with a trend amongst busy and stressed Silicon Valley techies: replace all meals with Soylent for 30 days, eating no real food. The goal wasn’t weight loss so much as to save time and money and increase productivity by not having to prepare meals. Three servings, or “meals,” of this stuff adds up to 2,000 calories, which is about the recommended daily intake for most people, so you’re probably not going to lose weight on these. So, Soylent isn’t meant to be used for weight loss, and it’s probably not a great idea to replace all your meals with it. But Soylent is a super nutrient dense, ready-to-go beverage that works great as a replacement for one or two meals per day if you’re short on time. They offer both traditional powder mixes as well as their Soylent 2.0, which are ready-to-drink bottles. SlimFast, the grandfather of all meal replacement shakes. I feel like almost everyone has tried this one at some point. But are they popular because they actually work, or just because they’ve been around for so long? The short answer: yes. SlimFast can absolutely help you lose weight if you pair it with a low-calorie diet and exercise. 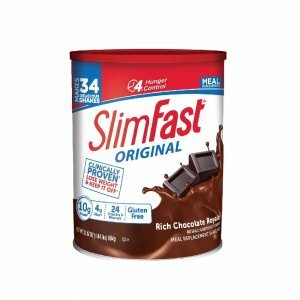 SlimFast has designed a 1-2-3 program for weight loss, which recommends consuming one healthy meal per day, two of their meal replacement shakes (200 calories each), and two of their approved snacks and snack bars (100 calories each). If your meal is around 600 calories, that puts you at 1,200 calories per day — easily enough to put just about anyone at a calorie deficit. So they’ll lose weight. Finally, with such a low calorie count per day, many people are left feeling hungry and thus more likely to fall off the wagon and binge eat. That being said, their simple 1-2-3 plan and the fact that there are no food restrictions makes it easier to stick to. They’ve been huge for decades, so obviously it’s working for a lot of people. 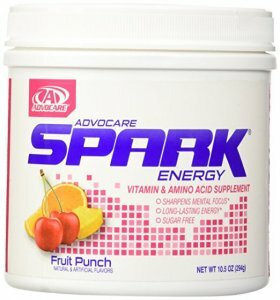 AdvoCare Spark by Advocare is marketed as a supplement that increases energy and mental focus. It blends 20 different nutrients, B-vitamins, caffeine, and taurine to create a formula that heightens awareness and energy without causing “the jitters.” It’s also sugar-free, low-calorie, and low in carbs as well. Think of it as a nutritional, weight loss promoting energy drink more than a meal replacement. At 45 calories, it’s both healthier and cheaper than that pumpkin spice latte at Starbucks. They come in fruity flavors like limeade, mandarin orange, and mango strawberry. They also cost a little over $50 for 42 servings, making them one of the more affordable options on this list. Their plant-based meal replacement shakes are made from natural ingredients and plant proteins, so you don’t have to feel like you’re missing out on the nutrients and minerals you get from eating whole foods. 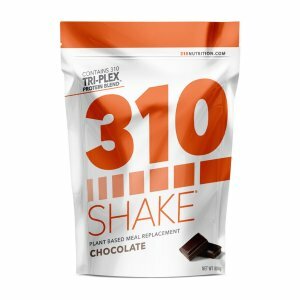 310 Nutrition uses a proprietary protein blend, called their Tri-Plex protein blend, that includes pea protein, brown rice protein, and hemp protein. Unfortunately, brown rice and hemp protein are low in essential amino acid lysine and thus can’t be considered a complete protein. The 310 shakes come in mocha, salted caramel, chocolate, vanilla, strawberry, and vanilla chai. They do contain dairy, so they’re not vegan. Because the shake uses a plant-based protein, some people complain about the flavor and the way the powder mixes in their drink. However, others have said that blending it with ice rather than shaking gets it to a good consistency and adding some berries and almond milk improves the flavor. The Plexus Slim “pink drink” by Plexus is a solid option, especially if you want a shake that targets both weight loss and gut health. 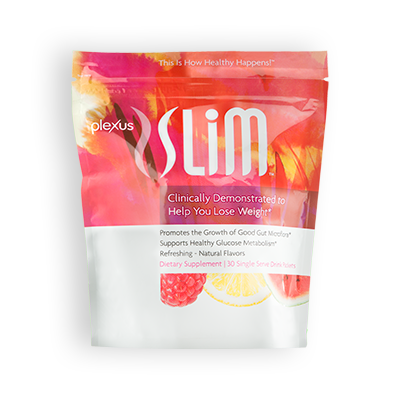 Instead of replacing a meal, Plexus Slim is meant to be consumed right before a meal in order to suppress your appetite. The powder comes in raspberry, lemon, and watermelon flavors, and it’s gluten free with no artificial flavors, sweeteners, or colors. Part 2: Why should you use meal replacement shakes? What are their benefits and side effects? Meal replacement shakes went from diet fad to diet staple decades ago. Most people have tried them at some point, but what exactly do they do for your health and weight regulation? Obviously replacing high-calorie meals with low-calorie shakes will aid in weight loss, but there’s more to the story. The primary benefit of most meal replacement shakes is that they lower your daily calorie intake. This makes them a very effective and simple tool for weight loss if consumed properly. However, there are plenty of benefits to meal replacement shakes for folks who aren’t interested in losing weight. Most of them are a quick and convenient source of protein and often, they contain enzymes and nutrients geared toward building lean muscle mass. This means they’re also a great option for enhancing your workouts. Some meal replacement shakes even contain enough vitamins and nutrients to fill nutrition gaps in your regular diet. Some people experience side effects such as bloating, cramping, gas, and diarrhea. This is often a reaction to certain ingredients within the meal replacement shakes. For example, some blends include dairy that may cause adverse reactions in people who are lactose intolerant. Additionally, increased fiber intake for people who don’t typically consume enough fiber may cause digestion issues in the beginning. If you are experiencing issues with digestion, consider switching to a meal replacement shake with different kinds of protein. It’s recommended that you start by replacing just one meal per day with a meal replacement shake. While some programs call for replacing 2 meals per day in order to accelerate weight loss, this isn’t recommended for long periods of time as the lack of whole foods in your diet could cause you to miss out on some important nutrients. Are meal replacement shakes bad for you? No, but every meal replacement shake is different. While nearly all of them provide adequate protein, some are lacking in fiber. Some use natural, organic ingredients, while some use more processed ingredients. A few meal replacement shakes even incorporate added sugars, hydrogenated oils, and corn syrup, so make sure you read the ingredients. What are the disadvantages of meal replacement shakes? Not all meal replacement shakes are as nutrient dense as full meals, so you don’t want to rely on them for a balanced diet. When should you drink meal replacement shakes? You can drink meal replacement shakes at any time. Because they are convenient and easy, many people like to take them to work and drink them for lunch or grab them on the go for breakfast. If you’re looking to maximize weight loss, you should replace your heaviest meal with a meal replacement shake. Can you eat with meal replacement shakes? While you can eat with meal replacement shakes, if your goal is to lose weight, it might not be a good idea. In fact, if you eat a full meal with your meal replacement shake, you may end up gaining weight. However, there are low-calorie shakes that are meant to be consumed before a meal to suppress appetite. Can you live off meal replacement shakes? Meal replacement shakes are meant to replace one meal per day, sometimes two meals for a temporary period of time in order to jump-start a diet. While you could technically survive on meal replacement shakes, you should be balancing them with whole foods. Do protein shakes help you lose belly fat? Yes. Consuming high amounts of protein can speed up your metabolism, which increases the rate at which you burn fat. Especially when paired with exercise, protein shakes can be very effective at helping you burn belly fat. Do protein shakes make you put on weight? If you are adding protein shakes to your diet rather than replacing a meal with them, and you’re doing nothing to decrease your calorie intake, they could make you put on weight due to a net increase in calorie intake. However, if you’re truly replacing one meal with a protein shake, it should make you lose weight. Is whey protein good for losing belly fat? Yes. Whey protein gives your body all of the amino acids it needs. If you’re pairing this with a good exercise routine, you will start to build muscle tissue with the assistance of whey protein and amino acids, and this will cause you to burn fat faster. Meal replacement shakes are a popular and powerful tool for weight loss and weight management, and they can even aid in building muscle mass if consumed with enough protein. The best part is that they’re fast, easy, and convenient, which is a big deal in the modern world, where most people just don’t have the time to cook healthy, nutritious meals and sit down to eat them three times per day. As long as you do your research and choose a high-quality product, there are very few downsides to meal replacement shakes. 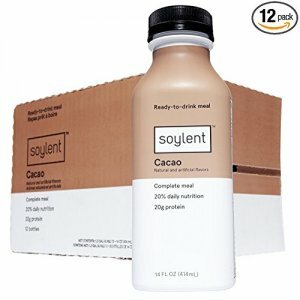 For MLMCompanies.org #1 meal replacement shake recommendation, click here. Hey, they made the list.